Small cruise ships at the Savusavu dock. The town and yachts are in the background. Landscape: Hilly and green, the south coast of Fiji's second-largest island is adorned with coconut palms and mangrove-lined bays. The town of Savusavu lies on the south side, near the middle. Visited: October and December 2004, including Halloween, Christmas and New Years. 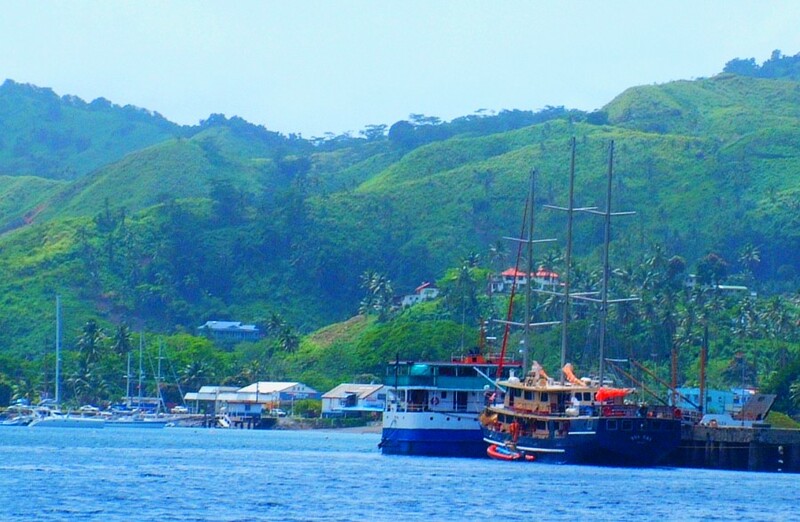 (Sue) Savusavu is a real cruisers' mecca in Fiji. Many boats arriving from Samoa or Tonga take the pass north of the Lao Group of Islands and use Savusavu as the clearance port into Fiji. A jovial, and knowledgeable Kiwi named Curly Carswell is the Savusavu yacht-helper. He runs Eco-Divers and an internet cafe, and he organizes weekly dinners and events for the cruising yachts. 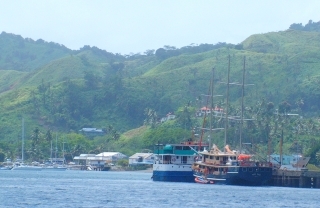 Savusavu has a small but growing tourist industry, with several small hotels near town. The largest (and most expensive) is the Cousteau Resort 5 miles out of town on a point near the lighthouse. Here the water is clear and the snorkeling is great on several bommies off-shore. At low tide in Savusavu you can see steam rising from several small fumaroles along the creek bed. Savusavu has a good vegetable and fruit market, a small yacht chandlery, internet cafes, Mo's Burgers (quite good), several small grocery stores, many small hardware and variety stores, and a nice choice of inexpensive restaurants. Most yachties hang out at the Yacht Club bar at the Copra Shed Marina. With about 30 permanent moorings embedded in the mud of the creek, the area claims itself to be a cyclone hole, but Jon and I felt there were too many boats, and the anchorage was too open to the west to trust it in a cyclone. There was also too much of a small town atmosphere to want to stay in Savusavu for the season, but we did enjoy the camaraderie of Christmas and New Years with the yachting community there and had a great time. We sailed twice from Suva to Savusavu and back a couple of times, stopping at the lovely offshore islands of Makogai (MAK-on-guy) and Naigani (Nang-GA-ni) where we found excellent snorkeling and a good sampling of the colorful soft corals for which Fiji is famous. 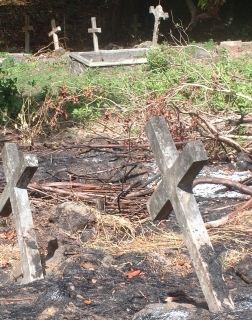 Makogai was a leper colony for almost a century, run by Catholic nuns. 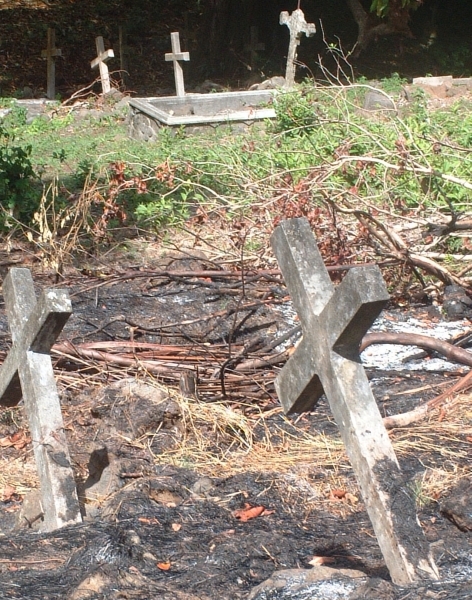 Deep in the palm forest we came upon the old cemetery for the leper colony. At the main anchorage there are still buildings and ruins from the colony, some of which have been turned into offices and homes for the marine biology station personnel. The biology station grows giant clams (three species) for re-seeding the reefs. (Amanda) Savusavu was the main cruiser hangout during the summer, and it was fun to dip into that community a few times, but after a while it got to be too suffocating. 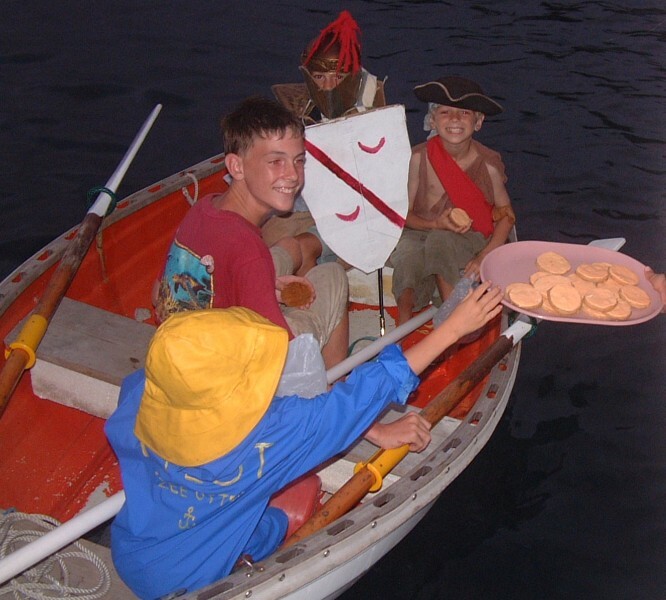 We've never really liked sitting around in the same place with a bunch of other boats when there isn't a lot of stuff to do ashore, in the water, or with other people. When we went up to Vanua Levu we mostly enjoyed anchoring near the reef outside of Savusavu proper, where the water was clear, the snorkeling was good, and we could pretend we were away from it all. We went on an island tour with a Kiwi family we met, which gave us pretty views of the reefs, and also visited the copra-factory, where we got a tour. 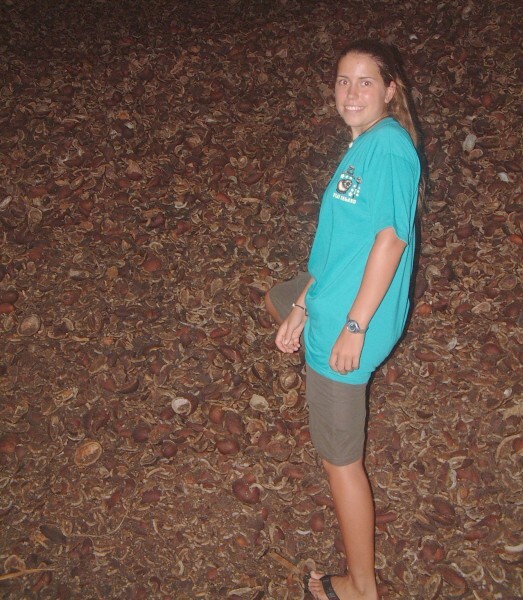 The factory got copra (dried coconut) from all over the South Pacific, and was completely self-powered. There was a power plant to one side, including an ancient-looking steam-generator sitting on the lawn. We're not sure if it was still being used. Big tanks on the other side of the one building stored the coconut-oil until a ship came to take it to Australia. Inside, the building was divided into two sections: Storage and the working machines. The storage area was most of the building, and had a large pile of unprocessed copra on one side and bags of dried chicken feed, the other bi-product of the copra, on the other. It would have been fun to explore Vanua Levu more to the east, but our time-crunch with impending visitors (Colin and Rori) pulled us west and south, towards the Mamanucas. As it was we spent one night inside the Namena Barrier Reef, west of Savusavu. There was a wharf and a small village where we anchored, and as soon as the hook was down all the kids started swimming out to us, some floating on inner-tubes. We had to shoo them off the aft-deck! Apparently we were the first boat to anchor there "this season," whatever that meant. Up on the hill above the village was a large wind-generator farm, which I'm sure my dad would have walked up to if we hadn't sailed all day and didn't have a long sail the next day, too. (Jon) We wanted to explore a lot more of north-eastern Fiji than we were eventually able to. The Lao Group to the east is reputed to be delightfully remote, and although permits to sail there were nominally $1000, we were able to get an invitation for only $40. Also, Jim Bandy, who runs the chatty "Rag-of-the-Air" net on 8173 KHz at 7am every morning lives out at the far NE corner of Vanua Levu. We'd been talking to Jim for several months and he even ran his net from Ocelot when he visited Savusavu. But Chris needed to use the high-speed internet connections in Suva to make his university applications, and then in early January, 2005, Sue cut her feet badly on a barnacle encrusted piling, so we never got to explore as much as we wanted. We had 2 unusual occurrences in Savusavu. First, we experienced our first bad case of cruiser politics. Groups of cruisers who were there for the whole cyclone season were forming little cliques, and we wanted no part of it. Instead, we ended up making friends with a (land based) family visiting from NZ. They were staying in the hotel above the anchorage, and we often went up there in the afternoons to use the pool. We had so much fun together that we hired taxies together for island tours and such. It was fun to get away from the cruiser community that we usually hang out with. You can read more about our activities around Vanua Levu in our Fiji Summer newsletter.